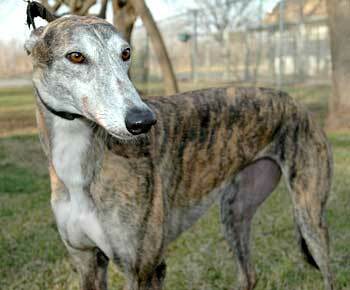 Torri, aka Pin Oak Torri, is a lovely 4-year-old brindle female born January 28, 2001. 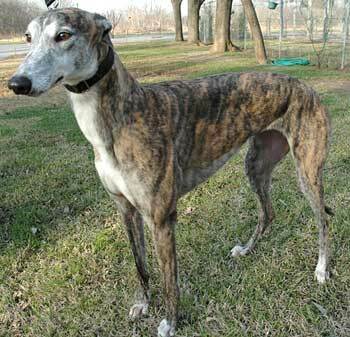 Torris sire is Gable Cupid, making her grand sire Wigwam Wag, and her dam is Pin Oak Amanda. 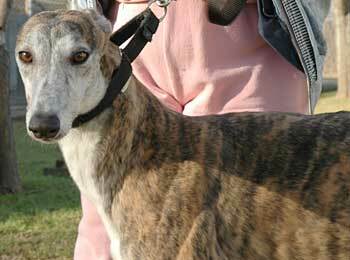 Torris racing career spans 79 races according to Greyhound-Data.com. She started November 10, 2002 at Raynham in Maine and finished her last race on December 3, 2004 at Valley Race Park in Harlingen, TX, racing also at the Corpus Christi track. Torris face is one of the most beautiful, with her lighter brindling and dark brown eyes, and her white bib that extends down on her chest. Torri is affectionate and very friendly. Torri is small animal and cat trainable - will need diligent work (displays curiosity, but responds to "no kitty").